Please, find a video where you can see clients’ opinions about the products of «Antonio Merloni Cylinders Ghergo Group S.p.А.» Company. This is a small talk, an appreciation which is melted in the story; they are ordinary people who have an experience of work with Italian vertical gas tanks, who appreciated all advantages of independent gas supply. “Profit can be fabulous or precarious” – aphorism says. The same is with the publicity. Publicity which is not confirmed by facts, experience, traditions and customers’ opinion is just a nice video, precarious conversation and dishonesty, served in golden cover. This way is not for “Antonio Merloni” Corporate! These are our clients’ small stories about their ways to independent gasification and to profits in use of vertical gas tanks. Tried different types of fuel they decided in favour of petroleum gas. 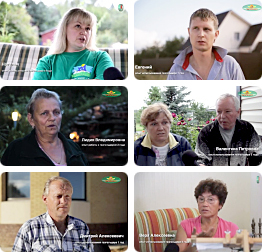 They were assured that independent gas supply is comfortable, clean, simple, reliable and optimal. They were surprised with our high experienced, outgoing, soft-core stuff, on-time consultations and assistance. Their own experience confirmed that the price corresponds to the quality and advantages of long living Italian equipment. And the most pleasant thing is that everybody is completely happy. To high appreciate opinion of people and give ear to it – here is a main measure of successful alliance between manufacturer and customer. It’s important because the last word rests with ordinary people who we work for, whose life we are trying to improve. And this word is extremely important. Treasured.